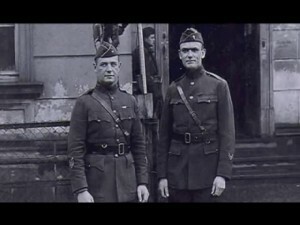 Father Francis Duffy (right) the chaplain of the New York National Guard’s 69th Infantry Regiment and Col. William "Wild Bill" Donovan, the commander of the 69th Infantry during World War I. NEW YORK CITY--As the chaplain of the 69th Infantry, Father Francis P. Duffy inspired a generation of New York National Guardsmen who fought in World War I. Now Air National Guard Maj. Gen. John Ellington, the National Guard’s top chaplain, wants the story of Father Duffy - immortalized by actor Pat O’Brien in the 1940 movie "The Fighting 69th" -- will inspire a new generation of National Guard Chaplains and inform Soldiers and civilians about the military chaplaincy. A video that interlaces Father Duffy’s story with the history of the chaplaincy, produced by the Air National Guard’s TEC TV visual information center, will tell that story. It will be shown to chaplains, leaders, and anybody else who wants to know about the National Guard chaplaincy, Ellington said. The video is can also be seen and downloaded from the New York State Division of Military Affairs website at: http://dmna.state.ny.us/video/video.php?vid=1297080000. The essence of the chaplaincy is being present with the troops and for the troops at all times, and nobody lived that more than Lt. Col. Francis Duffy, Ellington said. "He was present not only in World War I, but also on the border (in 1916) when he was called to Mexico," Ellington said. "He did his drills, he was called up, and he came back, just like we do today." "It tells who we are and what we are about," Ellington said. Duffy was briefly a military chaplain during the Spanish-American War when he served at a camp for returning veterans at Montauk Point, Long Island. He became chaplain of the New York National Guard’s 69th Infantry in 1914 while serving as the pastor of Our Savior Parish in the Bronx. The regiment earned its fame as part of the Irish Brigade during the Civil War and was reportedly dubbed the "Fighting 69th" by Confederate General Robert E. Lee. An Irish-American folk song, "The Fighting 69th" commemorates the regiment’s Civil War actions. Duffy accompanied the unit to the Mexican border in 1916 when National Guard troops were mobilized to stop cross border raids by Mexican revolutionary leader Pancho Villa. When the 69th mobilized for World War I and became the 165th Infantry Regiment he went to France. Duffy distinguished himself by his courage under fire, earning the Distinguished Service Cross and Distinguished Service Medal, and for always being present for to talk to the men and provide religious services. For his service, Duffy received Légion d’honneur and Croix de guerre from French military leaders. He is the most highly decorated chaplain Army history. The commander of the 69th, Col. William "Wild Bill" Donovan, a Medal of Honor winner who went on to establish American spy operations in World War II, valued Duffy’s advice and leadership. When the war ended he remained in the National Guard and returned to his parish at the Holy Cross Church in Hell’s Kitchen, in midtown Manhattan a block from Times Square. When he died in 1932, the City of New York held a public funeral, and a statue honoring him was erected in Times Square. When he first heard about Father Duffy and his statue he was amazed, Ellington recalled. He started learning more about Duffy and the man evolved into his personal hero. "He was someone that I just admitted and could look up to and think, ’When I grow up I would like to be like Father Duffy,’" Ellington said. When Ellington wanted to dramatize the history of the National Guard Chaplaincy-which dates back to the Connecticut Colonial Militia in 1637-he decided that Father Duffy was the perfect person to use. The then he turned to TEC TV for help in producing the video. TEC TV, located in Nashville, Tennessee, produces videos telling the Air National Guard story. The facility also produces the Minuteman Report, 60-second shows which report on both Army and Air Guard activities, and produces long form videos like "Father Duffy: His Story," said Air National Guard Senior Master Sgt. Jonathan Kadis TEC TV’s superintendent. Longer videos are challenging, and take more "front end work" to create, he said. "It takes a little more logistical work and home work of tracking down folks that might have historical perspective and rare artifacts," he said. "Like there in New York with the (Father Duffy) statue and museums," Kadius explained. Making the Father Duffy story involved doing on-location shooting with Ellington, and getting video of the Father Duffy statute in New York City as well as tracking down historic footage from World War I. Parts of the video were shot at the historic Lexington Avenue Armory in Manhattan where Father Duffy drilled with his unit. Chaplain (Col. ) Eric Olsen, the New York State Chaplain, is featured in the video talking about Father Duffy. He took Ellington on a trip to see Father Duffy’s statue in Times Square at the time the Chief of Chaplains was considering the video, Olsen recalled. He thought it was a great idea and was proud to participate, Olsen said. Being a New York National Guard chaplain means working in the long shadow Francis Duffy casts down to the present day, Olsen said. "I feel much honored to be part of this tradition," he added. Father Duffy isn’t the only famous chaplain from New York, Olsen pointed out. During World War II the troop ship Dorchester was torpedoed by a German submarine and sunk. Four U.S. Army Chaplains-a rabbi, two ministers and a priest-ignored their own safety to help Soldiers and Sailors save their own lives and comfort those who could not. One of those men, Reverend Clark Poling was a Dutch Reformed Church Minister from Schenectady, New York. And for a time the Army Chaplain’s School was located in New York City; at Fort Hamilton and then Fort Wadsworth , Olsen added. "There are certain principles and ideals that we need to fight for because if we do not fight for them against the forces of evil and selfishness and those kinds of nasty elements, then we will lose track of who we are and what we are, Olsen said. "And Father Duffy stood for that both in his civilian parish and in his military ministry."